From April 10 – 13, 2012, the TEDMED conference will be held in Washington, DC at the Kennedy Center. Look for reports from iMedicalApps.com attending on site. The concept for this conference comes from the TED Talks. TED stands for Technology Entertainment Design. The TEDMED conference can be described in numerous ways, but first and foremost it is a meeting of the minds of people from various walks of life and professional disciplines who are interested in sharing ideas about ways to improve health and health care. TEDMED has no particular theme other than idea sharing among people of various backgrounds. The conference is structured into short groups of time during which people either provide a short lecture (usually about ten minutes) or participate in an interview (usually about 20 – 30 minutes depending on the status of the person being interviewed). These short presentations allow people to focus their statements and provide the best information they have or not. The quick format is difficult for a number of speakers – even experienced ones – so a number of speakers either communicate their point in a mild way or have to stop without finishing what they wanted to present. The conference features talks by leaders in the health care / public health field such as the director of the National Institutes of Health who spoke on April 11th as well as the Chief Technology Officer of the United States. Instead of giving their typical talks, these officials are pushed to say something meaningful, creative or inspirational in a short period of time. US Chief Technology Officer, Todd Park, discussed the potential of multiple stakeholders in one city to use technology (mainly electronic health records) to decrease health care costs from the “ground up.” The conference also provides a space for artistic expression – such as dance and poetry – that is related to health. Although, TEDMED claims to not have a specific agenda, the conference address what it calls “Great Challenges” of health and medicine. While numerous challenges are of relevance to mHealth, the only speaker with a professional focus on mHealth issues is Halle Tecco, founder and CEO of Rock Health who is speaking on the challenge of Developing Tomorrow’s Medical Leaders. The meeting takes place annually and recently moved from San Diego to Washington, DC, making the event more accessible to the nation’s leaders. The meeting is also broadcast to “hi def auditoriums” through the country. These are mainly university sites, but also hospitals, not for profit, and other organizations that agree to show the TEDMED talks during the conference for free. These showings are paid for by generous donations from the American Association of Medical Colleges, Siemens, and the California Endowment. Overall, TEDMED is an interesting place to hear some new ideas and gain inspiration. The fact that it is a sold out event says something about its influence on thought leaders. If you’re not at TEDMED, we suggest you check out one of the hundreds of hi-def auditoriums available. You can stop by anytime to pick up some inspiration from one of these talks. The talks are not focused on mobile apps but are relevant to different aspects of health just as mobile apps are so you are bound to find some talk of interest to you at TEDMED. 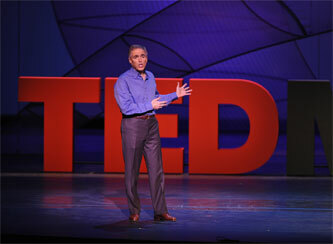 Additionally, please watch this video if you would like to have a general overview of what TEDMED is all about.